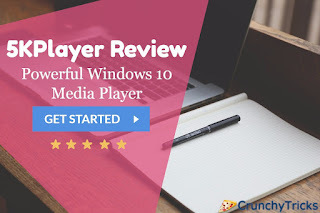 Doing a search for top media players for Windows 10 on the Internet, I found 5KPlayer, totally free and fascinating, standing out in tons of media players including VLC media player, KMPlayer, and other well-known ones. 5KPlayer offers you an intuitive interface, versatile media file playback, fast video downloading, new AirPlay streaming and proper data management, which will be reviewed one by one in detail below. 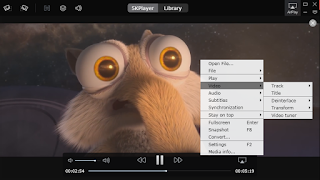 Icons as Video, DVD, Music, Radio, YouTube, and AirPlay appear on user interface once you open 5KPlayer, giving you the quick guide to each core function of 5KPlayer. On the top, you can find Library to manage media files through 5KPlayer, which will be introduced later. By the way, the streamlined design with the darkest black color fits itself to Windows 10 properly. As highlighted on the interface, 5KPlayer deals with video, DVD, music, and Radio. Being the primary function of a Windows 10 media player, playing feature is weighted significantly. Therefore, a full review regarding playback will be done. 5KPlayer can cover various types of video formats such as MP4, WMV, AVI, MKV, FLV, MOV, M4V, RMVB, MPEG as well as audio formats like MP3, AAC, FLAC, WMA, WAV, AIF, OGG, and so on without installing other codecs as long as you keep it to the latest version. Besides, 5KPlayer is not limited in video definition since it is engineered to play 4K videos. This media player can play SD, HD, 1080p/4K UHD videos smoothly on Windows 10. Also, 5KPlayer is a region-free DVD player and satellite radio player. With an emphasis on easy customization, 5KPlayer offers a right click menu to make changes to video, audio, subtitle and more while playing. From here you can open new files, check recently played files, adjust contrast/brightness/saturation, synchronization audio/video/subtitle, plus rotate video by 90 degree/vertical/horizontal in the case of some phone recording problems. Tips: - If you find some less-known formats like VDAT that 5KPlayer can’t recognize from the folder, just drag the file to 5KPlayer, and the media player will play automatically. To extend you video/audio resources offline, 5KPlayer provides the function of downloading online videos from 300+ video hosting sites, such as Daily Motion, Metacafe, Yahoo, and other famous sites too. Moreover, 5KPlayer is capable of downloading 4K UHD videos on your Windows 10. Click Library icon, and you will see the three steps to downloading online videos. Follow the guide; you can get the video you want. To find out the video you downloaded or change the video download folder, go to Settings (shortcut: F2). Tips: - When URL analysis result came out, click the gear icon you can use choice video formats and resolution to download according to your need. 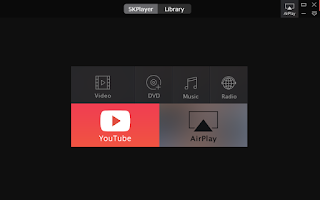 Airplay-supported 5KPlayer allows you to stream video or music from iPhone/iPad/iPod to your Windows 10 PC to have a large screen enjoyment when your iPhone/iPad/iPod and PC are under the same network circumstances. If you want to record a game walk through from iOS devices, just get 5KPlayer on your Windows 10 and connect it with your iOS devices. It is a pity that you cannot AirPlay Android devices to 5KPlayer on your Windows 10 directly. Through Library on 5KPlayer, your media files are orderly arranged in Favorites, YouTube, and Playlists. By clicking the heat icon aside the video/music, you can add the file to the Favorite list; by clicking New List, you can create a new playlist. To add new files, just click the plus (+) icon; to remove a file, select the file and click the minus icon (-). Please note that Ctrl/Shift/Ctrl-A shortcuts are also applied to 5KPlayer when you need to select multiple files to add or delete. Furthermore, 5KPlayer can convert any video to AAC/MP3 music, meeting the need for extracting audio from video. Also, 5KPlayer provides various playing modes such as single, order, circulation, and random, which can be switched in Library by clicking the repeat icon beside the minus icon (-). For the convenience of finding a file in the playlist, 5KPlayer supports searching files. Tips: - To Add a folder to playlist, you can drag the folder to the list that you want to add. Scrolling the mouse wheel while playing, you can enlarge or shrink the screen. 5KPlayer, with its compact multi functions and quick user accommodation, is currently my best choice on Windows 10. Although it still has a lot of space for improvement since it is young, 5KPlayer makes the difference in some fields like dealing with UHD videos compared with other classic media players.